Dimensions 457'9" by 72'0" by 14'5"
Late 1944: Light antiaircraft increased to 16 20mm guns. U.S. units also had 1 5"/38 DP gun, 2x4 and 2x2 40mm Bofors AA guns. Landing Ships, Dock, or LSDs, were fairly large (4500 tons) oceangoing vessels used in amphibious invasions. They were derived from the Popper Ferry, a 1920 design for a barge transporter for use on the Danube River, redesigned by the British in 1942 and constructed in American shipyards. They likely were inspired by the Japanese landing craft depot ships, whose operations were followed with great interest by American and British observers of the landings in Shanghai in 1937. Each had a dock in its stern that could be flooded by ballasting down the stern of the ship. This gave the LSD the ability to transport, load, and launch several smaller landing craft. The ships were considerably faster, roomier, and more seaworthy than LSTs, reducing the likelihood of a bad trip. First used in combat at Tarawa, they revolutionized the offloading of tanks on a beachhead by allowing them to be transported preloaded into LCMs. It was discovered in the field that LSDs were also extremely useful for the maintenance and repair of landing craft, which suffered tremendous wear and tear every time they were run up on a beach. As a result, several LSDs were redesignated as landing craft repair ships. A few more were redesignated as PT boat repair ships. A total of 25 of these ships were built, of which four went to the British as Lend-Lease. The design was continually refined and there was much variation between individual ships. Those units constructed at Oakland are sometimes listed separately as the Ashland class while the units constructed on the East Coast (including all the Lend-Lease units) are listed as the Casa Grande class. 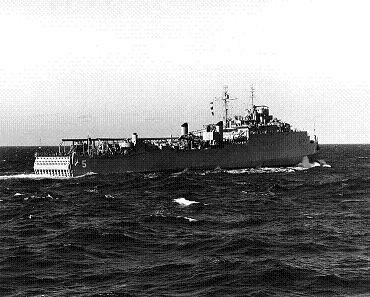 LSDs are the direct ancestor of the amphibious assault ships in modern navies.